Everyone needs to show what they’re bringing to the table. That’s one of the things I’m learning at George Mason University’s first offering of the Executive Chief Learning Officer graduate certificate. How do learning and performance teams let everyone else know they’re providing value to a company or organization? Enter the Learning Value Chain. A Value Chain, as defined by Michael Porter in his book Competitive Advantage, is “a set of activities that a firm operating in a specific industry performs in order to deliver a valuable product or service for the market.” Michael Porter put the value chain concept together because he believed it was a model teams could use to show how what they do adds value to the company. When a company is comprised of teams who do nothing but activities that add value to the company, that company will be competitive. Activities can be of a supporting nature, like maintaining firm infrastructure and managing human resources, or they can comprise the business’s primary reason for existence, such as making sure the company is providing products and services to its customers. 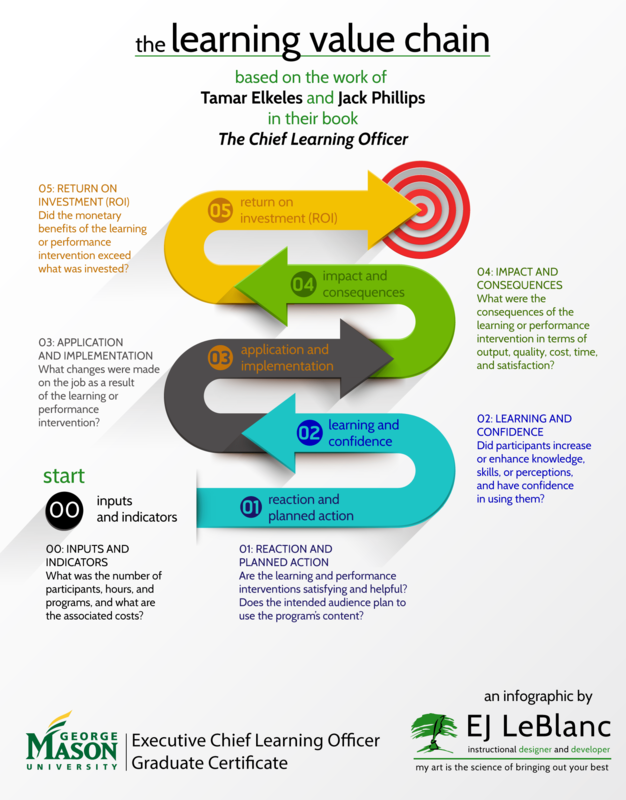 Jack Phillips, one of the authors of The Chief Learning Officer, mapped the Value Chain model to the learning industry through Donald Kirkpatrick’s four levels of evaluation (adding level 5, ROI), and called it the Learning Value Chain. Each level of the chain has its own metrics, rules, and outcomes. But, if you’re familiar with the metrics presented by Kirkpatrick’s levels of evaluation, and you understand the basic principles put forth by the ROI Institute, you’re far more than halfway towards understanding this model. I made an infographic that breaks down the Learning Value Chain by its levels. You can view it below. It’s worth noting that another take on the Learning Value Chain model was put forth in 2009 by Lynette Gillis and Allan Bailey from the Centre for Learning Impact. They present a somewhat simpler view of the model, as they combine some of the previously mentioned levels into four discrete steps. Nonetheless the concept is the same. THE FUTURE: OFF THE CHAIN? What does the future hold for the Learning Value Chain? This is a model that provides a great framework for anyone wanting to build a system to provide real-time feedback and reports as to the efficacy and value of learning programs. Currently, very few learning interventions are ever tested for ROI, because of the enormous amount of work required in order to determine these values. Learning Dashboards could unquestionably make that quandary a thing of the past and make immediately available accountability data for every learning and performance project a reality. Do you know of any learning dashboards using the Learning Value Chain as a framework to provide real-time data on all levels (0-5) of the Learning Value Chain? Let me know if you do. I’ve also recently become aware that learning leaders like Will Thalheimer and Clark Quinn have a lot to say about the Kirkpatrick Model and how it can be improved. Both of these leaders agree that Level 1 “smile sheet” assessments are next to useless in determining whether or not a learning or performance intervention was actually effective. This one of the major reasons why Will recently published his book, Performance-Focused Smile Sheets – to change how these Level 1 assessments are being implemented. There’s a lot more that these two legends agree on. As a matter of fact, it’s worth listening to the debate Brent Schlenker recently livestreamed here. But that’s not the only dissenter to the Kirkpatrick-based value chain. Another learning legend, Allison Rossett, states that, because Kirkpatrick crafted his model 60 years ago, the model needs an overhaul to account for all the ways technology and culture have changed over the decades. She gives an absolutely fantastic presentation about this here. In case you don’t have time to watch the entire presentation, the bottom line is that Dr. Rossett posits we should be following her “Marble Message” – where Marble is an acronym as illustrated below. There is an awful lot of overlap between Allison’s Marble Message and the Learning Value Chain. But Allison knows we should be updating the Learning Value Chain to the latest learning technologies. I have no doubt she would argue that we take advantage of today’s “big data” to demonstrate our results – and to do so from the inception of a program, not as an afterthought. It’s a great time to be in the learning and performance business. Soon, when we take full advantage of these technologies and start tracking the return on investment for all of our projects, not just a select few. We’ll be able to empirically document and report upon the crucial value we bring to companies – in real time. When it comes our turn to show what we’re bringing to the table, it will be known we’re at the core of every successful change effort, every successful endeavor, every successful new hire, every successful employee, and every successful leader in every major company in the world. And that means we won’t be an afterthought or considered dispensable. It means that, if we’re doing our jobs right, we’ll be invaluable.